The name Ciudad Rodrigo honors Count Rodrigo González, who established the town in the 12th century after a Moorish invasion. 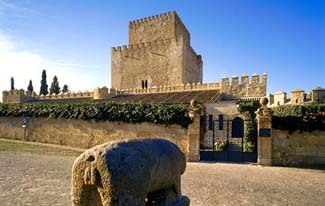 In time, the town also served as a fortress to launch various expeditions against Portugal. It was not until the early 19th century that Ciudad Rodrigo’s greatest moment arrived. The castle was a battle site between the armies of Napoleon and the Duke of Wellington in the Peninsular War, which raged on for five years and left much of the country in ruins. In 1810 the French Marshal Ney besieged the castle and finally captured it. Wellington’s armies retreated to Lisbon where, in turn, the French forces were defeated. In 1812 the Duke of Wellington moved an offensive counterattack on Spain. Ciudad Rodrigo was one of the first towns to be secured by the British and became a turning point in the war. For his efforts, the titles of duke of Ciudad Rodrigo and grandee of Spain were conferred on Wellington by the grateful Spanish. Ciudad Rodrigo is a charming, well-preserved medieval town strategically placed on the Agueda River. An ancient Roman bridge crosses the river toward the Portuguese border, which is just a short distance away. Situated on a small hill, the town was once defended by the square tower dominating the 14th-century alcázar and by the ramparts surrounding the town. The charm of Ciudad Rodrigo is found chiefly in its narrow streets and in the courtyards of the old baronial mansions. You can circle the town by walking on the ramparts. Ciudad Rodrigo is just over the Portuguese border on N-620. Buses and trains stop here. Salamanca is 86 km to the east. Although devastated by time, the castle is now expertly restored. With its square keep and crenellated walls—which remained intact through the years—the outside of the parador looks somewhat austere, but flowers and ivy growing over the building soften that effect. Inside, the atmosphere is warm and charming. Tile floors are highly polished, and regional handicrafts decorate the hallways and public rooms. Brightly colored bedspreads and rugs accent the cozy guest rooms. One room still has its original vaulting. Bathrooms are modern. An attractive dining room provides views of the river and surrounding countryside. The menu includes such regional specialties as cured hams and sausages, pork filets, and trout. The entire town of Ciudad Rodrigo is a Spanish National Monument.